Looking Forward is the latest release from an ensemble that combines Indian classical music with western colors in a highly improvisational format to create their own unique brand of world music. 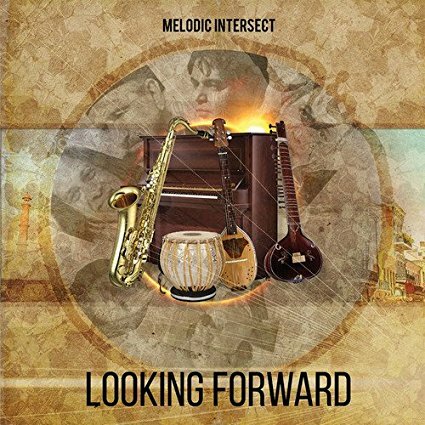 The ensemble is called Melodic Intersect and Looking Forward is their sixth CD. Consisting of: tabla player and leader Enayet Hossain, Hidayat Khan who plays the sitar, Greg Hatza plays keyboards, Joy Islam plays guitar, Fred Koch plays saxophone, Avirodh Sharma plays percussion and Qamar Abbas plays the Cajon. Setting firmly in the realm of world music, Melodic Intersect also has a lot of jazz elements to their music. The eight tracks organically unfold in an arching musical story, that is conversational and rhythmically active. Each composition is built around the varied and complex rhythms that combine Indian classical music with other middle eastern percussive patterns. Each player listens and builds upon each other and the theme, resulting in a magnificent world music sound. That’s the short of it! Strong melodic themes and forms. Intricate improvisations and rhythmic interaction is the cornerstone of this group. Enayet Hossain’s tabla playing is a real treat and even though the music is highly improvisational, because of the groups ability to listen and build upon each other’s musical statement, the music is listenable and easy to follow. Exotic sounds and rhythms that will booth soothe and excite the soul with its Middle Eastern flare. The thoughtful and melodic improvisations blend the melodic colors and embellishments of jazz and eastern music set to the rhythms of the middle east. The music is virtuosic and melodic, and that is the true intersect!